Getting started with LED pixel Christmas lighting can be an incredibly overwhelming experience. That is the main reason we have put so much time into documenting our experience so it can help others. You won’t be able to anticipate every issue or need, but some forethought is needed to avoid a lighting disaster. Before ordering our first pixels, we did a fair bit of prep work to calculate how many we would need and where they would go. For the pixels lining the features of the house, we settled on a nominal 4 inch spacing between pixels because it worked well with the 10cm wires that come standard on the Technicolor pixels (you can have them manufactured with custom lengths but we find the standard to work well). We started by drawing a diagram of the house and taking detailed measurements of all of the places on the house where we wanted pixels (this was the beginning of Philip’s insane amount of time spent on the roof). With these measurements, we could calculate how many pixels were needed for each section. We gave each section a name and took our first cut at determining how we would group the sections onto each of the DMX universes. Each universe can handle 512 channels, which means that a universe can have at most 170 pixels (assuming each pixel is 3 channels for RGB). Due to power concerns, we found that fewer pixels per universe is better than more pixels. 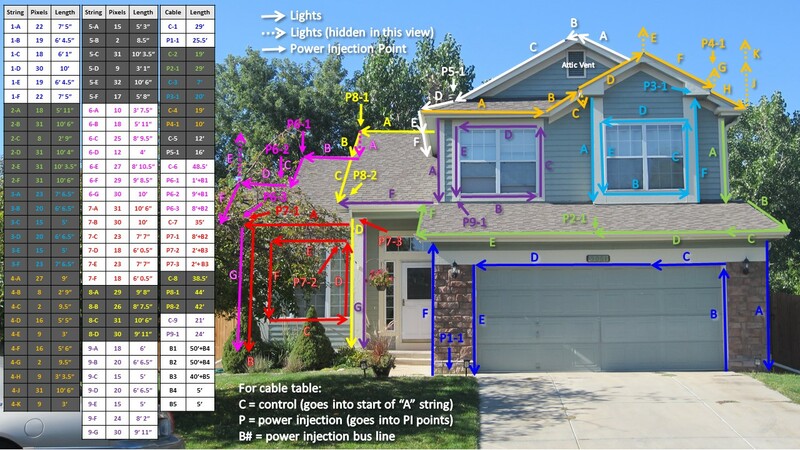 The master diagram for the pixels in our house showing the different universes and spots for power injection. Each line represents one physical section of lights mounted together. The colors denote the different DMX universes and the numbering scheme is “Universe” dash “section letter”. The physical sections are actually labeled with descriptive locations such as “office window right” or “mid roof left 1”, though that is not captured in this diagram. Connecting wires between sections or to the start of a universe are not shown. All nine universes originate in the front of the attic behind the rectangular metal vent at the top of the house. UPDATE as of 2017: Universe 1 now originates at the front right corner of the garage. UPDATE as of 2018: Universe 6 now originates from the ceiling of the front porch. Universe 7 is daisy-chained onto the end of Universe 6. On the note of power, there is a whole separate page dedicated to our power issues saga, but here is the brief synopsis. We ran into several types of odd behavior while testing the system, all of them ultimately attributable to pixels not getting enough power. As such, we had to inject power into some of the universes in multiple places, rather than just at the start of the pixels along with the data line. As you lay out the universes, if there are more than about 75 pixels or if the start of the universe is a long way away from the pixel controller and power supplies, then it is wise to plan for power injection. We found that power injecting in the middle of a universe works well, but some of our further universes require 2 or more power injection points. When diagramming, it is also important to mark the directionality of each section. Pixels are directional for the data line (they have a little arrow on the pixel body showing the direction) and you will save yourself time and aggravation if you get it correct the first time. We ended up moving two sections from one universe to another late in the process and had to cut a bunch of zip ties and reattach the pixels in the other direction; not the end of the world but better to avoid if possible. Finally, we named each section on the diagram so that we can use the same name on the actual section of lights. This way, there is no ambiguity next year as to where each section goes and how it is to be wired. With this prep work done, we were able to move on to ordering our pixels and had a pretty good idea of how many we would need. For reference, here is the pre-2018 diagram before we altered the wiring of universes 6 and 7. You can see the ridiculous amount of power injection needed for the left side of the house and it still wasn’t really sufficient as some of the LEDs over there would flicker when running at full power bright white. The pre-2018 master diagram for the pixels in our house showing the different universes and spots for power injection. Each line represents one physical section of lights mounted together. The colors denote the different DMX universes and the numbering scheme is “Universe” dash “section letter”. The physical sections are actually labeled with descriptive locations such as “office window right” or “mid roof left 1”, though that is not captured in this diagram. Connecting wires between sections or to the start of a universe are not shown. All nine universes originate in the front of the attic behind the rectangular metal vent at the top of the house. As of 2017: Universe 1 now originates at the front right corner of the garage.